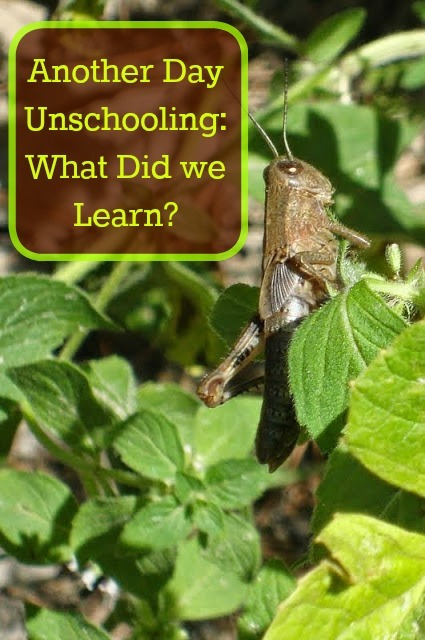 More and more as we brace this unschooling philosophy and lifestyle, I am left wondering "what did we learn?" I like to look back through our day and see what types of learning activities we were engaged in and I tend to naturally break down what they were learning into subjects. It helps me find added value in how we are filling our days and reaffirms my decision to stick with unschooling. Learned all about praying mantises watching Wild Kratts during breakfast. Evan excitedly told me that the praying mantis we found last year must have been a female since it's body was so large. He learned that females are always larger than the males and usually two times as large. Watched Clash of the Titans to further our Greek Mythology study. The boys were enthralled with Perseus's journey but laughed at all the special effects. We watched the old, classic, version and Alec insisted that many of the animals were robots and not really animals. I explained that they were meant to look like real animals but that was the best they could back then before computer animation. Read another two chapters in Harry Potter. Evan read 10 Little Caterpillars with a bit of help from me but did a great job decoding new words. Alec finished reading his 5th Secret Zoo book and is hopeful that a 6th book will be coming out soon. Ian finished reading Back to School, Weird Kids Rule! We exercised together as a family each doing 25 push ups, 25 sits ups, & 30 jumping jacks (though Alec chose to do 60). Evan had karate for a bit of added physical education and even earned his last patch by memorizing the tenants of Tang So Do. The boys and I also took a nature walk as part science/ part exercise. We walked for over 30 minutes around our neighborhood and through our woods. We noticed changes that have taken place since the start of the summer. The brooks is completely dried up and we discussed why that is and when it will change. The boys were then hoping for rain to fill it back up. They missed tossing sticks in and watching them float downstream. We found grasshoppers, grapes, butterflies, bees, and flowers. We saw beetles, turtles, and water lilies too. Alec brought one of his wooden swords and battled invisible enemies while practicing some of his karate moves and techniques. Evan broke off a very small, dead, tree trunk and pretended to be Groot. For arts and crafts, Alec finished coloring his samurai paper and proudly displayed it at the dojang. The boys worked on some more loom bracelets. The boys built with our Trio blocks making different vehicles, spaceships and toy guns. They pulled out Lego's and staged some sort of battle using their Chima vehicles, Chi, and guys. I often wonder if one of them will be a future engineer or architect with all the building and creating they do.